From time to time I’m going to post examples of either my jury slide photography or jury images I’ve fixed. 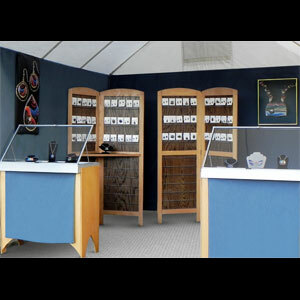 Here’s an example of an improved booth image. 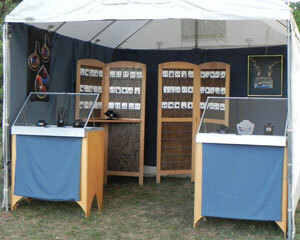 I worked with the artist advising him about how to set the booth up, and then what changes needed to be made after he sent me the first few images. After cropping and the color correction, the wrinkles were taken out of the display cases and from the fabric hanging from the walls of the canopy. Then a carpet was put down over the grass. There are more booth jury image tips in tn the booth section, including a list of 26 tips on how to take your own booth picture.